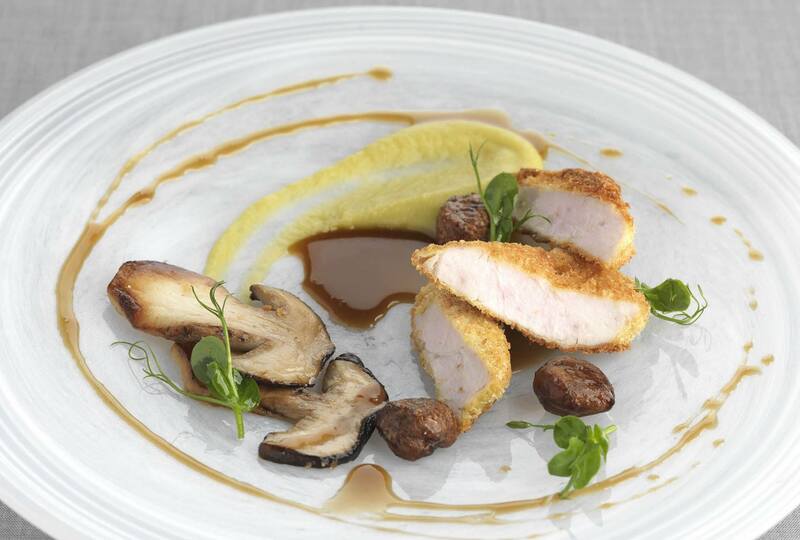 These soft creamy sweetbreads are encased in a curried crumb and served with a trace of split pea purée, roasted chestnuts, and garlic and thyme pan fried ceps. Place the sweetbreads into a bowl and cover with milk, season with salt and allow the sweetbreads to soak in the refrigerator overnight. Soak the split peas in water and leave to soften overnight. Remove the sweetbreads from the milk, discard the milk. Transfer the sweetbreads into a pan of salted cold water and bring to a boil. Allow to boil for 5 minutes. Drain, cool slightly then peel the thin skin from the outside of each sweetbread. If the sweetbreads are large then slice into medallions. Mix the breadcrumbs with the curry powder, salt and pepper. Coat each piece of sweetbread in a thin layer of flour, then beaten egg and finally breadcrumbs. Refrigerate until required. Drain the split peas and add to a saucepan with the carrot, onion, bouquet garni and bacon. Top with plenty of water and cook until the peas are very soft, about 45 minutes. Discard the carrot, onion, bouquet garni and bacon. Pass through a drum sieve, season, add cream and butter and allow to cool. Refrigerate until required. Clean and slice the cep mushrooms. Peel and crush the garlic. Pick the thyme leaves off the woody stems and discard the stems. In a pan, heat the butter and add the cep mushrooms, garlic and thyme. Cook until soft and golden, about 2 to 4 minutes and season to taste. Preheat oven to 180°C. Roast the chestnuts whole in butter for 10 minutes. Baste frequently. Heat the veal jus in a small pan and reduce until a coating consistency is achieved. Season and keep warm. In a pan, heat the butter and pan fry the sweetbreads turning until golden all over. Slice into evenly sized pieces. Heat the split pea purée in a small saucepan. Using the back of a spoon, spread some of the split pea purée onto the plate. Arrange the sweetbreads around the pea purée. Add the roasted chestnuts and cep slices. Finish with a drizzle of the veal jus and garnish with pea shoots. Chestnuts and ceps, two of autumn’s most celebrated crop are paired with sweetbreads and split peas for a perfect meal. As a general rule, this dish should be an aged red wine’s best friend. For example the hearty flavour of these ingredients complementing the meaty, mushroom, warm spices, undergrowth flavour of a traditional Rioja Reserva. However on this occasion, the curry powder could clash with the tannins, therefore, the wine needs to be very smooth and elegant with very little dryness. The Rioja Reserva, Viña Real Oro, 2009 from CVNE, in northern Spain, should be up to the challenge. It is a complex wine, concentrated with a mellow long finish and a reminiscence of cherries macerated in brandy. Alternatively, a smooth New World Pinot Noir with three or four years of age should also work. This style of wine is perfect served in large globe shape glasses to enhance the aroma and increase the freshness of palate. Enjoy!